During a visit to Tehran, the head of the United Nations nuclear watchdog has expressed satisfaction with Iran’s commitment to its obligations under the 2015 nuclear accord with world powers. “Iran has been committed to its obligations and this is an important matter,” the International Atomic Energy Agency (IAEA)’s Director General Yukiya Amano said on Sunday at a joint press conference with Ali Akbar Salehi, the head of the Atomic Energy Organization of Iran (AEOI). The nuclear accord, officially known as the Joint Comprehensive Plan of Action (JCPOA), was signed between Iran and the P5+1 group of countries — the US, Britain, Russia, France and China plus Germany — last year in Vienna. The IAEA is tasked with monitoring the technical implementation of the nuclear deal. Since January, when the JCPOA took effect, the agency has confirmed Iran’s compliance in several reports. 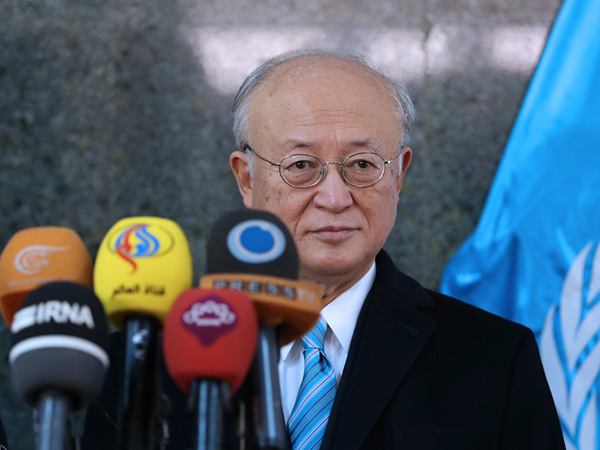 “We are satisfied with the trend of the JCPOA’s implementation, and hope for this trend to continue,” added Amano, who is in Tehran on a one-day visit at the invitation of Salehi. Concerning his meeting with Salehi, he said the two had discussed a range of issues, including heavywater, enriched uranium, Iran’s uranium stockpiles as well as research and development in the field of nuclear energy.